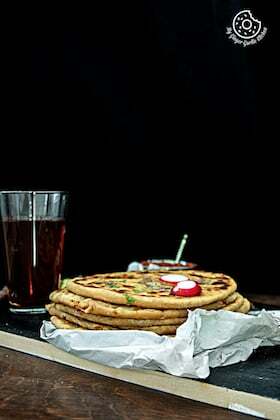 Duppad ( दुप्पड़ ) is a layered Indian Flatbread which gets separated into two layers after cooking. Achaari Dahi Bhindi ( अचारी दही भिन्डी ) is a dry vegetarian side dish, which goes perfectly for serving over steamed rice or with a side of naan or any other flatbread. Wohooo! Dishwasher is fixed now, FINALLY! Do you guys remember, I told you about my broken dishwasher in my last post here. The good news is that the maintenance guy came yesterday and he fixed it finally. It took about one hour. Well, I did not realize that it takes that amount of time. But the machine looked quite complex underneath. l am in a happy mood today, so let me tell you about this happy meal I am sharing today. Nope, it’s not McD’s happy meal. It’s a meal which makes me happy every time I eat it. So are you ready for this? This meal is a combo of a flatbread and a stir-fry. A perfect meal for me. 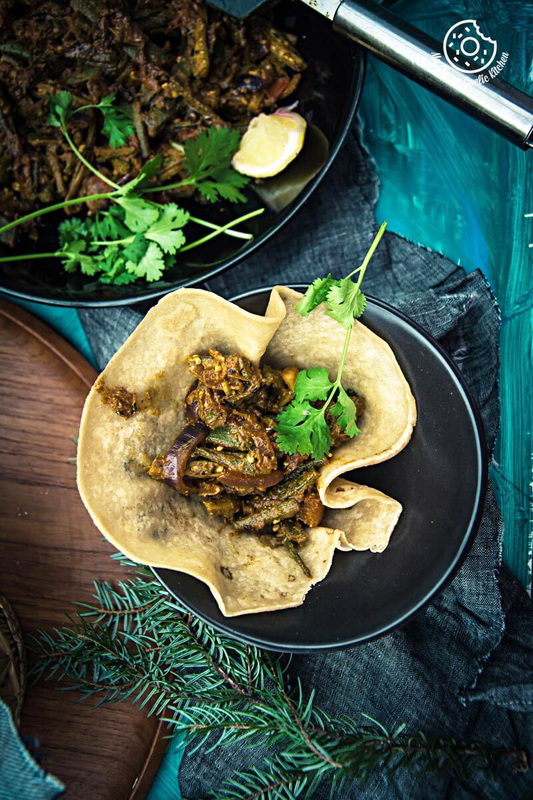 This meal is ‘Achaari Dahi Bhindi With Duppad Roti // Pad Wali Roti’. What is Duppad / ‘Pad wali roti’? 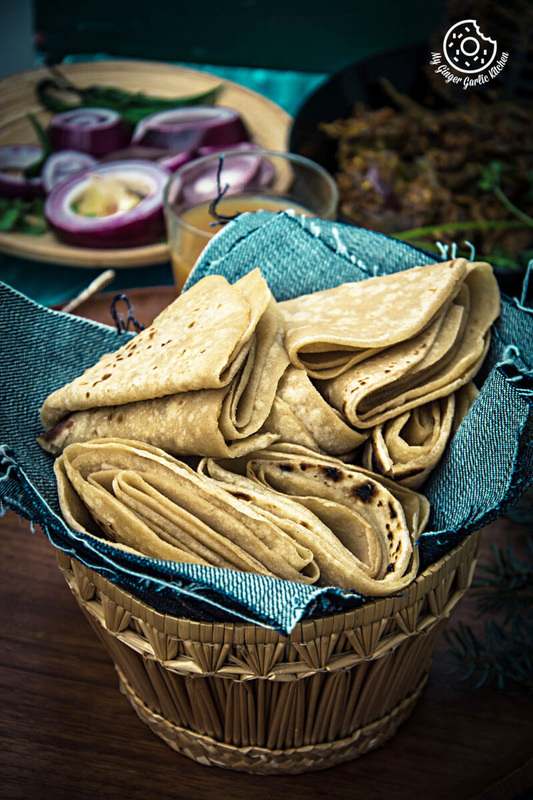 Duppad ( दुप्पड़ ) is a layered Indian Flatbread which gets separated into two layers after cooking. Duppad is a Hindi word which means two layers. 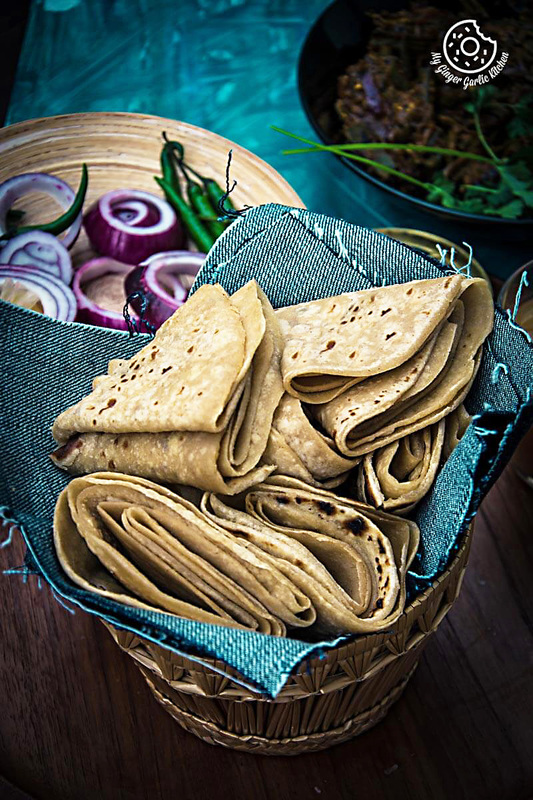 Duppad aka dupalli roti ( दुपल्ली रोटी ) is beautifully unique because of the special way it is rolled. I grew up eating this roti thinking that this is some traditional Rajasthani recipe. And one day during internet surfing I got to know that this roti is a very famous Gujarati roti and called Pad-wali Roti ( पड़ वाली रोटी ) or Pad roti ( पड़ रोटी ). 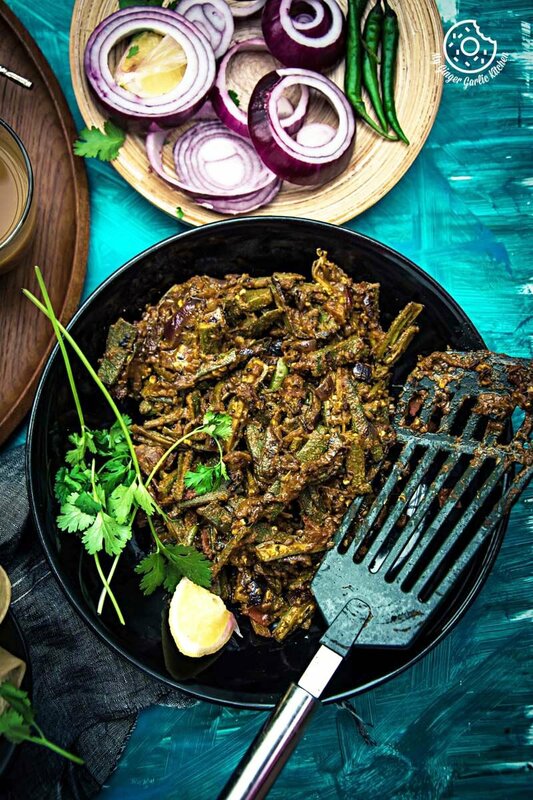 Bhindi // Okra // Ladies’ finger stir fry is one of the best side dishes which goes perfectly with duppad roti. So I decided to share this roti with bhindi achaari. These rotis also go well with aam ras (आम रस, mango milkshake). I know it sounds strange but believe me, it’s a superb combo. Achaari Dahi Bhindi is a dry vegetarian side dish, which is great for serving with a side of naan or any other flatbread. 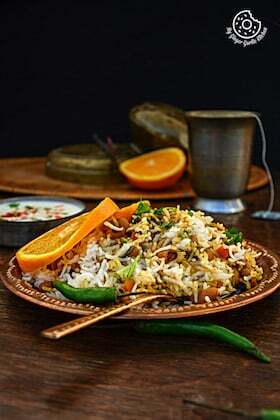 This is a spicy and tangy side dish like a pickle ( अचार ), that’s why the name. 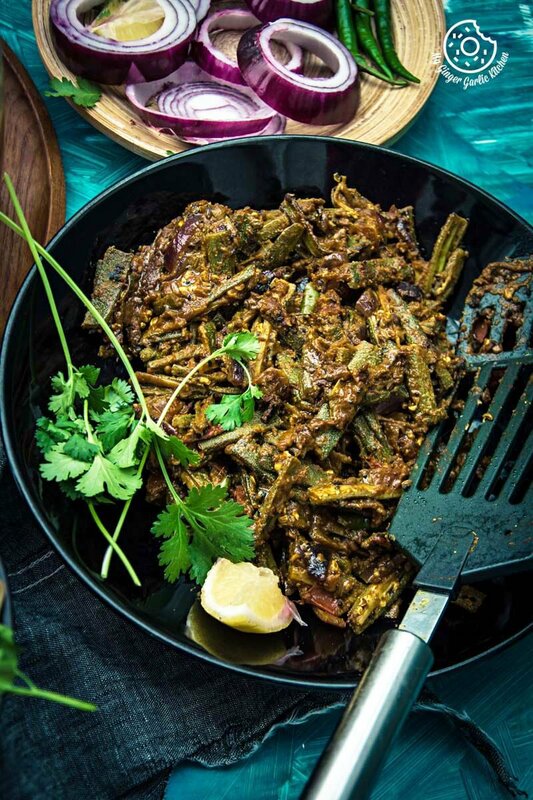 In this dish, Bhindi/Okra is cooked in mustard oil along with some whole pickle seeds and powdered spices. 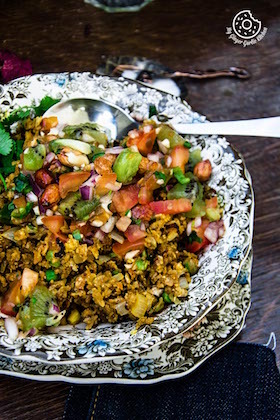 This stir-fry gives just the right amount of sourness due to tomato and yogurt. 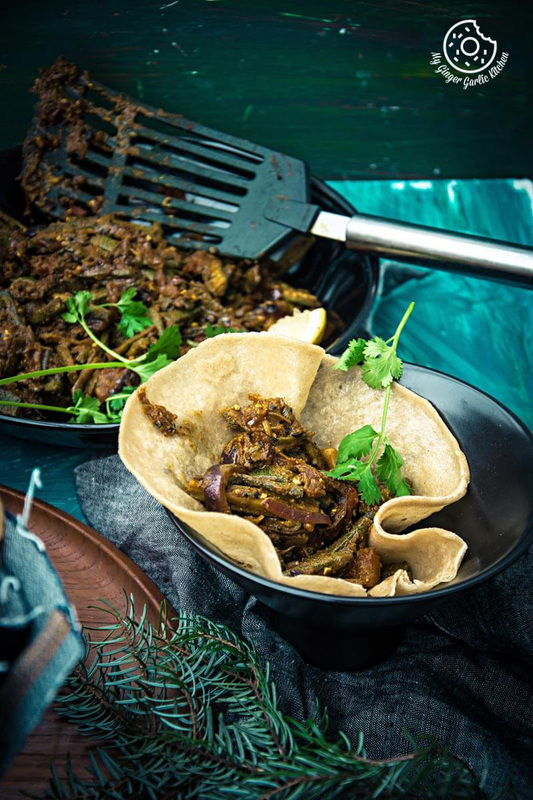 The green chilies are added to give that fiery flavor but you can surely omit them, and adjust the amount of red chili powder to make this side dish less fiery. 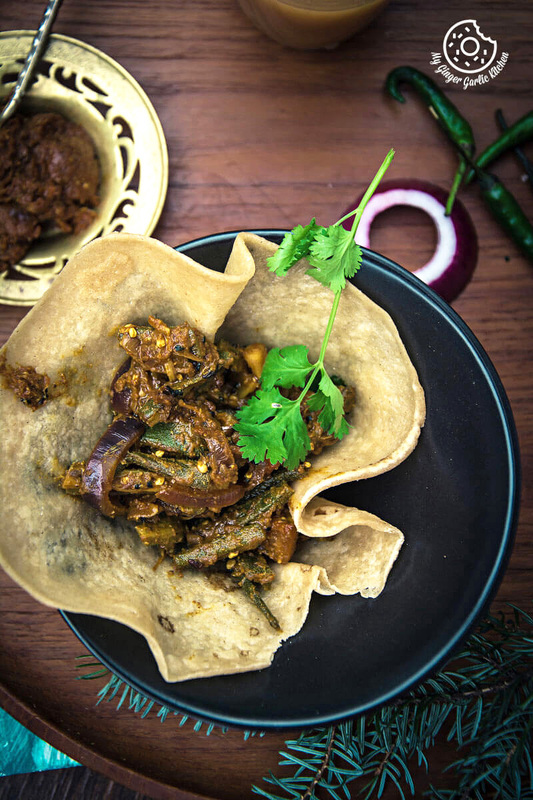 This side dish of Bhindi Achaari along with duppad roti is what REALLY makes this a true Happy (Dinner) Meal. Heat oil in a non-stick pan. 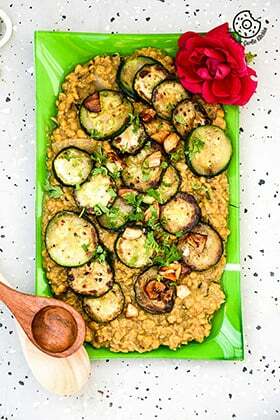 Add nigella seeds, fennel seeds, mustard seeds, fenugreek seeds and sauté on a medium heat for a few seconds. Add asafetida and toss well. Add green chili, salt, and turmeric powder and sauté for a minute. Add chopped ginger, chopped garlic and sauté for 30 more seconds. Add bhindi/okra and sauté for 5-7 minutes on medium heat, while stirring occasionally. Add chopped tomatoes, and sauté for 1 minute. Add coriander powder, chili powder, garam masala powder and mix well. Add yogurt and mix well. Cover and cook for 3-4 minutes, while stirring occasionally. Add mango pickle and mix well. Let it cook for another minute and remove from heat. Add 2 cup whole wheat flour, salt, water and knead to make a soft dough. Apply 1 tsp oil and shape into a ball. Divide the dough into 12-14 equal sized balls. Now take two balls and flatten them. Dip one ball into oil and dip another one into dry flour. Join both balls and merge them together by pressing and seal the corners as shown in the video. Roll this into 7” circle. Cut the edges with a pizza cutter or knife to make an even circle from all the sides. 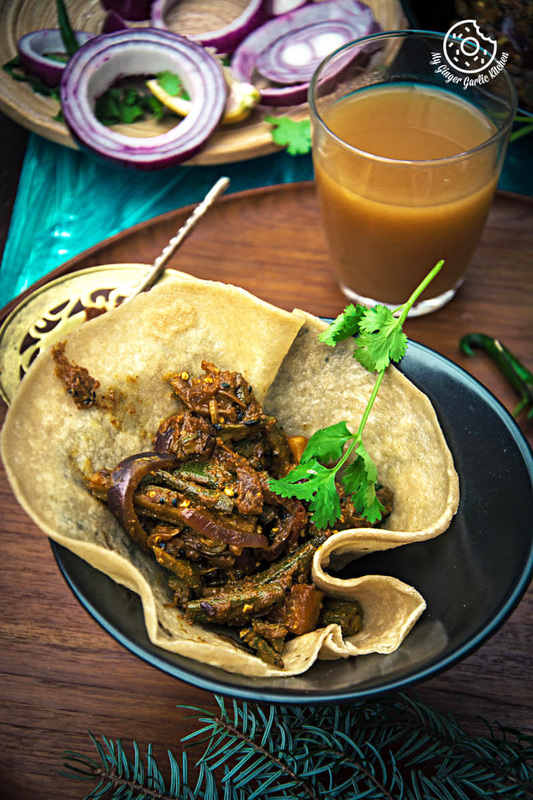 Heat a pan or <g class="gr_ gr_238 gr-alert gr_spell gr_run_anim ContextualSpelling ins-del multiReplace" id="238" data-gr-id="238">tawa</g> and place the rolled roti. Once you see the bubbles, flip it and roast on the other side. Press the circle evenly with a napkin on all sides with very soft hands while roasting. This process would separate the layers . Now carefully pick the upper half of it on the side and pull over gently to peel off the layer completely. This time, you will see that the chapati has split into two equals. Remove from heat and place them on a plate. Smear them with ghee and roll them into triangles as shown in the video.